Uttar pradesh public service Commission UPPSC now going to publish the official notification Advertisement for the recruitment of Review officer RO and Assistant Review officer ARO for various department of UP. All candidates who hold the eligibility Criteria for समीक्षा अधिकारी/सहायक समीक्षा अधिकारी आदि प्रार0 परीक्षा they can fill application form online at the official website of samiksha Adhikari from September 2018. 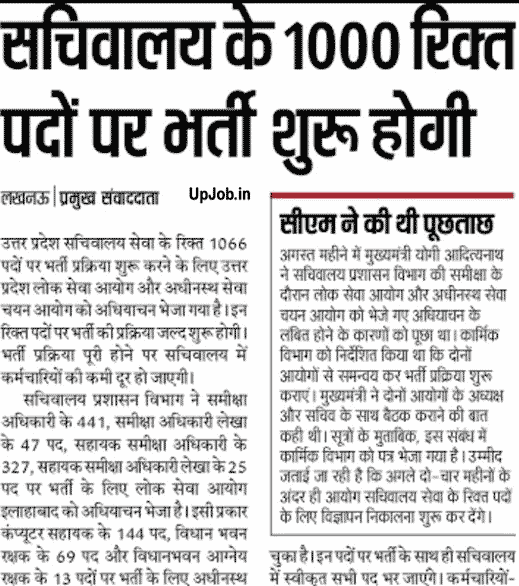 This is a very good opportunity for those who are searching a Good Job of UPPSC in government department. Application form submission RO /ARO posts have been started online. Last date of application form submission is October 2018. Official advertisement will be also published in the employment news / rozgar samachar of October 2018 edition. Important UPPSC Latest recruitment details as are follows. Education qualification: Graduation degree as on last date of application form submission. Few post required special education qualification which is as are following. RO (Account), Samiksha Adhikari (Lekha), ARO (Account), Sahayak Samiksha Adhikari (Lekha), U.P. Secretariat. Graduation degree and O level Certificate from DOEACC and minimum speed of twenty 5 words per minute in Hindi typewriting. i.e. they must have not been born earlier than 2nd July, 1978 and not later than July 1, 1997. Selection Procedure ; selection of the eligible candidates will be don on the basis of the written examination pre , written examination main and personal interview test. Question paper 2 of pre examination will be related from general Hindi and this paper will carry 60 marks for 60 questions. All questions will be objective type. After that those candidates who will be declared qualified in the pre examination they will be call for main examination. (1) Heading of Given Passage, Precise and explanation of the under lined parts. All Vacancy notification is available in Hindi and English language at commission website which is mentioned above. First of all candidates are required to Do registration with commission website in stage 1 registration process. After that you will get a registration no. After completing part 1 registration you can generate E Challan for depositing application form fee offline. You can also pay application form fee via you ATM card, Debit card, Internet banking, Visa card or SBI I Collect service. After filling application form fee , now complete your application form fee via submitting your Challan no. don’t forget to take a print out of dully filled application form . Candidate have option of paying application form fee through online mode like credit card, debit card , net banking or offline line mode Like SBI E challan form. Uttar Pradesh Subordinate Services Selection Commission is going to issue notification for recruitment of various vacant posts of secretariat service in Uttar Pradesh very soon. The number of those posts is 1066. All the candidates who wish to apply for the recruitment of various posts of the Uttar Pradesh Secretariat can apply their applications from the official website of Uttar Pradesh Subordinate Services Selection Commission. Uttar Pradesh Public Service Commission and State public Service Selection Commission do recruitment on posts under the Uttar Pradesh Secretariat Service. Uttar Pradesh Secretariat has sent proposal to the Commission to recruit 266 posts. Very early recruitment process will be started. With the completion of the recruitment process, the shortage of employees in the Secretariat will also be overcome. The Department of Secretariat has sent a report to the Public Service Commission, Allahabad for recruitment of 441 review officers, 47 posts of review officer account, 327 of Assistant Review Officer, 25 posts of Assistant Review Officer accounting. Similarly, 144 posts of Computer Assistant, 69 posts of Vidhan Bhawan Rakshak, 13 posts of Legislative Building Fire Service have been sent to the Subordinate Services Selection Commission. With the recruitment to these posts, the posts sanctioned in the secretariat will be filled. I have completed my bsc(pharma) I do not have computer certificate...can I apply. I have complete my b.com but don't have computer certificate, can I apply for this post?? Now o level is not necessary... government has closed it. do we need to send the hard copy of application form to UPPSC ?? Read carefully advertisement...ur queries get answered. Hello sir , I am MCA qualified. I have not O Level certificate. Is there MCA degree is measured as equivalent or higher degree as O level.Please give your valuable advice. I have computer science engineering degree , Do i still need 'O' level certificate in computer ?? Sir I have done b.a. in economics and have ccc certificate. can I apply for aro post?